Had a good conversation this morning with Mark Linzer, (my new Rx bandmate) who called. He mentioned the Star Tribute article this morning. I reiterated that We do not have time linger on anger. Yes, I will always be angry at what happened to my wife and how it happened. But to linger on anger with "should haves, and woul haves" does not help. And If you know Krista, you know that would piss her off more than anything else. She would remind us, "You cannot change what has happened, so now what you are you going to do." The values we shared and expressed for our children, If a person is sincere in their apology and makes honest steps in the right direction to better themselves, their behavior, and not hurt others in the crossfire, Then we can work with them. In one of our last conversations about her work in building trust among team members, she expressed her ongoing frustrations with the culture, "I just want people to be honest! I can work with that!" When they refuse to acknowledge how they have hurt others, passing blame on to external things; claiming they don't remember; or won't change because they feel others are "controlling them" or say, "There is plenty of blame on all sides" - Well then, we have no use for that , we maintain our distance and hope they will eventually grow up. So in this light, I would really like to see the defendant make a concerted effort to turn his life around, discover the kind of person Krista lived and Live Up to her standards. To better himself and better those around him. Just as I ask each and every one of you to do the same. "Seek to Understand" and "Assume Positive Intent"
I have had conversations with many friends regarding how I found out Krista was killed. It is an emotionally draining topic, each time I tell it. So about a month ago, I was up in the wee hours of the morning and related the events of how I found out. This article from 1989 describes the kindred spirit with whom I feel in love. Krista was killed on June 1, 2017 on her way to her voice lesson after leaving work (Director of Organization Development) at HCMC. Krista's time was precious but despite her hectic work life, she volunteered for many years. As a Nova parent, she organized the Used Uniform Sale,lending her valued HR & OD skills to Committees. October 2nd marks our 24th wedding anniversary, and our 25th Class reunion from Luther College, where she earned a double major in History and Anthropology with a minor in Classical Civilizations. 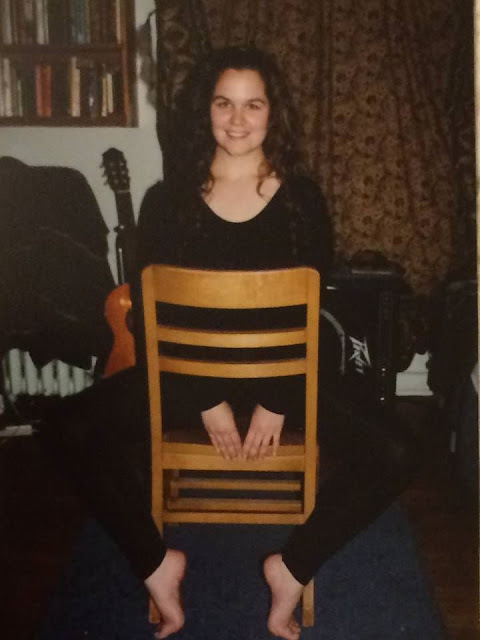 She spent a J-term in Nepal, she was active in Dance, Choir, served as Larsen Hall R.A. and VP of Delta Alpha Delta,; she was also an active member of Environmental Concerns, etc. 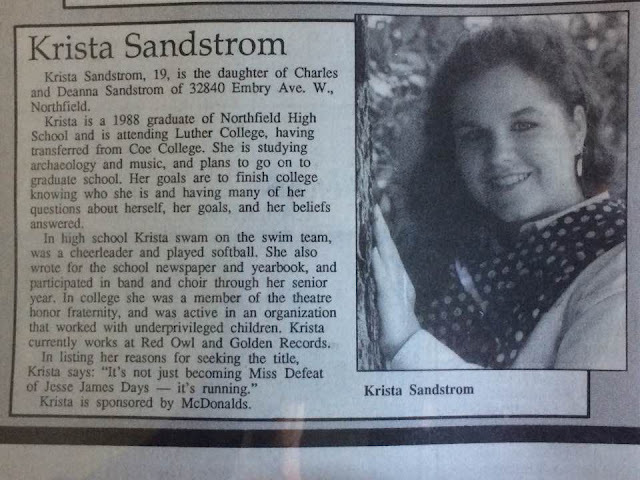 She is a 1988 graduate of Northfield HS where she was active on the swim team, softball pitcher, basketball & wrestling cheerleader, bassoonist for band, singer in choir. She earned a Masters of Education, and a PhD in Organization Development and Leadership from the University of Minnesota.